Having a sibling who is a picky eater can not be easy. Having two kids, I don’t mind making a separate item for lunch or dinner for them to eat. I don’t mind cooking something extra at all. I know several parents who insist that the children eat what the adults eat at the family dinner table. I have a friend who makes one thing, and if the kids do not eat it, the kids don’t eat. I call that child abuse by Hamburger Helper. I don’t adhere to the “You eat what we eat” rule for several reasons. First, I would rather make something that they will eat than deal with hungry and grouchy children. Also, I understand not wanting to eat what someone else has picked out for you to eat. Sometimes foods just don’t sound or look appealing. Another reason, I don’t mind cooking. I love it. So, to make an extra dish or even extra dinner is not a big deal. Making macaroni and cheese for them to eat while we eat pork chops keeps the peace and the sanity. I’ll take all of those things that I can get. I usually only make one extra thing. I like to cook, but I can’t do it all day, for heaven’s sake. Mr. Picky has only a handful of food he likes, bless his heart. He likes cheese, bread, spaghetti, macaroni, chicken in random chunk forms, and variations on these things put together. If I don’t feed him a form of food from this short list, he will not eat. He is not acting in protest. It’s more like he doesn’t have to eat. Food is something he could give or take. I don’t know that feeling at all. Sometimes his sister takes a hit when the choices on the table aren’t to her liking. That isn’t very often, though. She’ll eat anything. Not being the picky eater, though, she is not who I cater to. 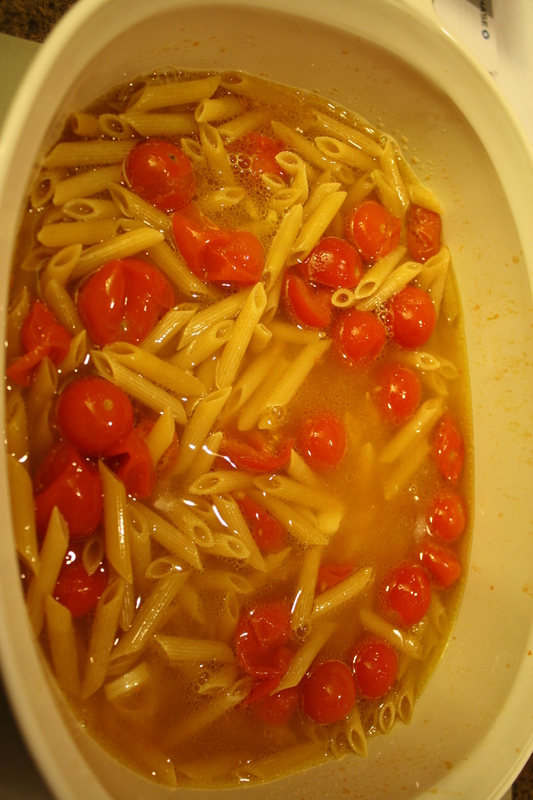 One go to meal for the both of them is pasta with butter, a splash of olive oil, and parmesan cheese on top. I cook the pasta and then stir everything in while it is all still warm. It suits Mr. Picky just fine. He will eat and eat and eat. Miss Helper? She knows how to make do. Thank goodness she can eat almost anything. 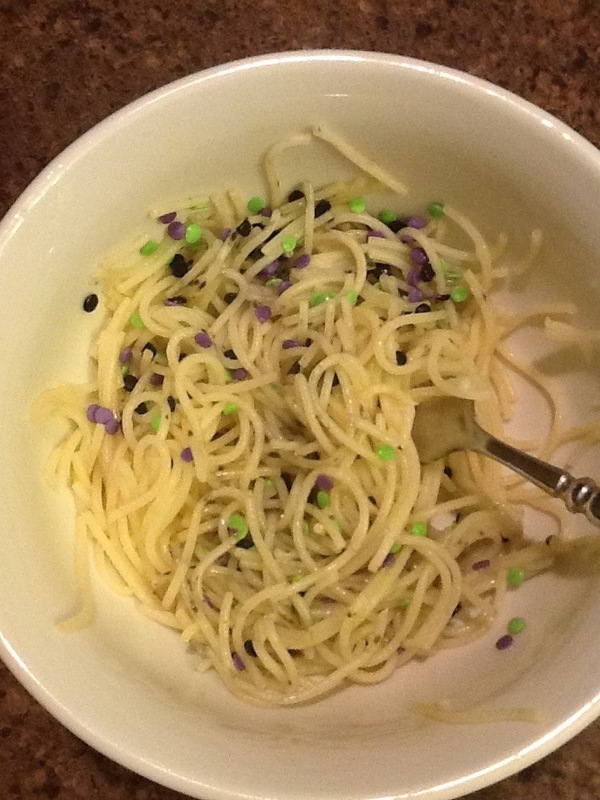 Especially with purple and green sprinkles on top. Once at lunch in the breakroom at work, a friend was eating this scrumptious shrimp dish. Being the nosey food person that I am, I asked him about it. He explained that he was eating the leftovers from his birthday meal the night before. His mom made it for him every year. Later, he gave me the recipe. I made it and thought it was delicious, simple, and filling. No one else really liked it, so I only make it about once a year. Saute the mushrooms and onions in butter. Add the shrimp and wine. Cook until the shrimp are pink-no more than three minutes. Remove the shrimp and vegetables with a slotted spoon. Add the cream cheese and milk to the same pan. Wisk until smooth. Then, add the cheese and continue wisking. Return the shrimp and vegetables and mix. Serve over pasta. I made this just a few days ago. It was as good as always. I’m already looking forward to making it again sometime next year. I love R. Ray’s magazine. The overall makes something drab absolutely fab. 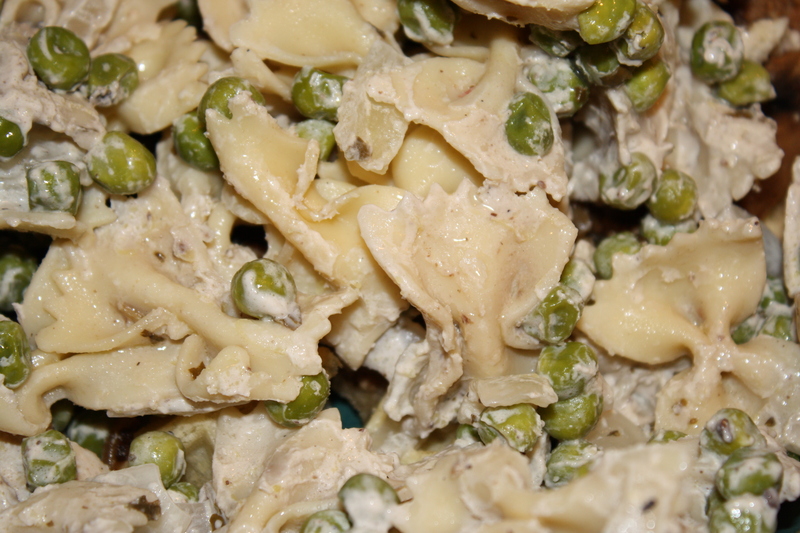 Recently, I decided to try her recipe for pasta with all the good stuff I love in it-peas, ham, cream. Mmmmm. Her recipe calls for a thin, curly edged pasta called “riccia.” I looked for it to no avail, so I subbed in bowie or fafalle. I also amended her original recipe by leaving out the homemade pesto. 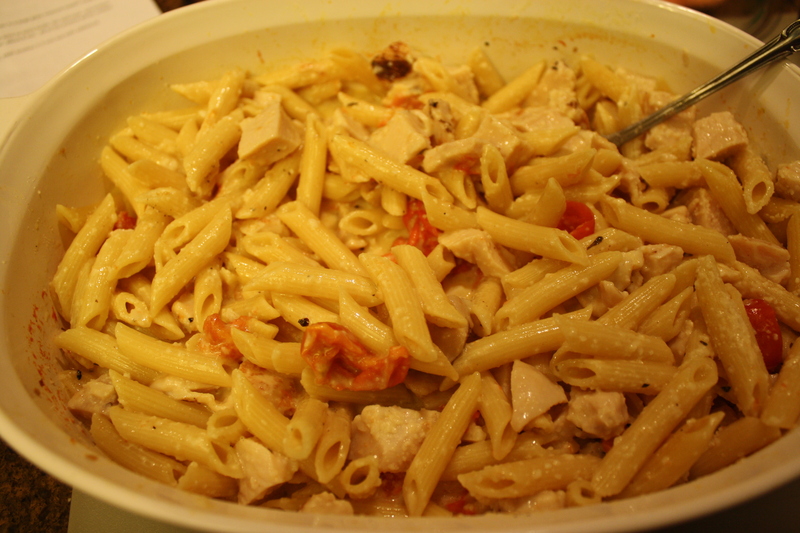 I like pasta with cream sauces to be pure and simple. Pesto seems so fussy. When it was done, I loved it since it was very, very close to the same thing found in expensive, authentic Italian restaurants. One box of bowtie or farfalle pasta from Wal-Mart. Boil water, add salt, follow package directions. Melt 2 T of butter in a large skillet. Chop one large onion, and add to butter. Soften the onion in the butter for about five minutes. Add one package of prosciutto that has been cut into one-inch cubes or bites. With that, add one small bag of frozen sweet peas. Stir. Add 1/4 c of white wine and 1/4 c of chicken broth. Cook for three minutes. Add 1 c of heavy cream and a dash or two of Parmesan. 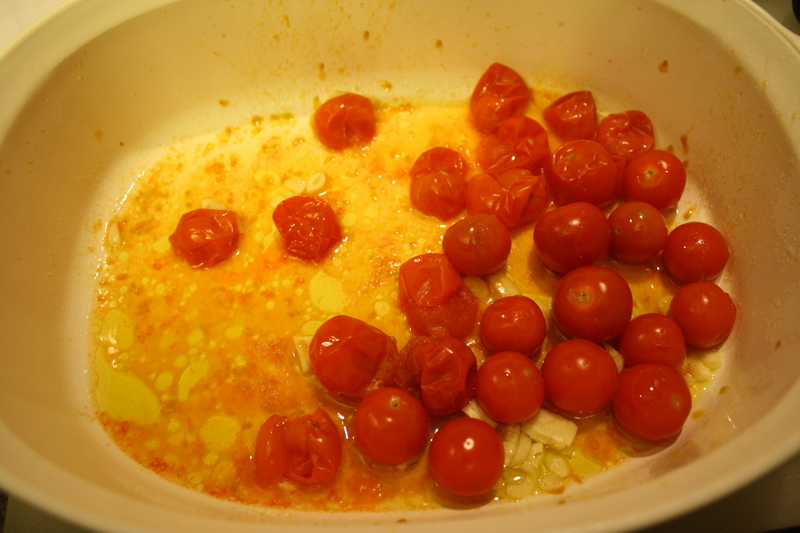 Reduce heat to low and let thicken for about four minutes. If you have any leftover grilled chicken, throw that in to warm. Mix the pasta and the sauce. Plate it and put it in front of someone you love.